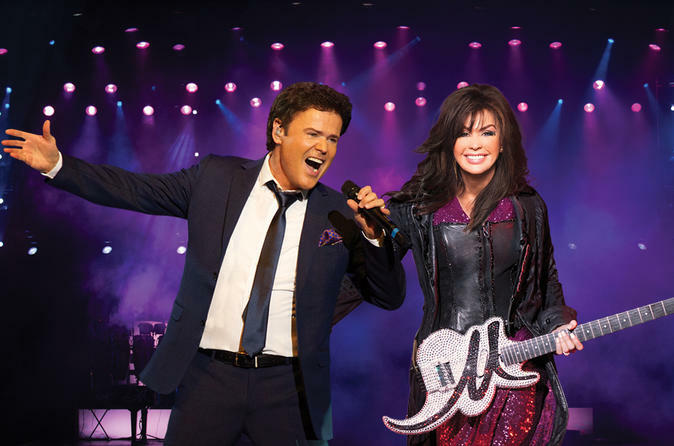 Donny and Marie Osmond bring their distinctive talents and undeniable charm to Flamingo Las Vegas. These icons of music and television are set to dazzle and delight audiences of all ages. This 90-minute extravaganza will showcase Donny and Marie's greatest hits in a multimedia spectacular presented on a custom-designed stage with multiple video screens and a large cast of electrifying dancers. Donny and Marie's timeless hits include "Paper Roses", "Make the World Go Away", "I'm Leaving It (All) Up to You", "Morning Side of the Mountain", "Puppy Love", "Soldier of Love", "Deep Purple" and others. This will mark the first time in 29 years that the dynamic pair have performed an extended residency engagement in Las Vegas. The "little bit country, a little bit rock n' roll" duo took the country by storm with the debut of the "Donny and Marie" variety show in 1976, becoming the youngest primetime hosts in television history. This universally popular series solidified their worldwide fan base which still numbers in the millions. After multiple solo successes, the pair teamed up once again in 1998, hosting the successful, nationally-syndicated daytime talk show "Donny & Marie". Special Offer - Book with us and save 33% compared to the local operator's price! - Book Now!